Fire is one of the most feared elements of the earth and is often associated with demons. Fire will be a friend if it is small because it can illuminate and warm the room. Meanwhile, the fire will be disastrous if it is large because it can burn anything it passes. The red rooster is another name for a big fire, getting bigger if it is not handled quickly and precisely. In this case, it is the fire department that is responsible for extinguishing it. They extinguish traditionally by spraying water from the water tank from the truck they carry. Or it could be from the nearest water hydrant sprayed through a hose. This is one example of fire control that is generally carried out to control fire. In addition to this method, fire control can be done only by using the mind, this ability is called Pyrokinesis. Pyrokinesis is the ability to ignite, control or extinguish the fire with the mind. This word was first mentioned in the novel by Stephen King entitled Firestarter in 1980. Maybe you imagine it like in the movie Avatar the legend of Ang is more or less like that example of fire control. Even so, no one has really been exposed to the media by people who have this power. So, most people do not believe and consider it a mere trick or trick. Even though there are many practitioners out there who have proven this power, like martial arts experts, and monks in Tibet. In connection with the existence of Pyrokinesis, in 2011 in the Province of Antique, Philippines, it was shocked by the supernatural ability of a three-year-old girl who was able to predict and create fire with the mind. The local mayor even testified that he had witnessed a pillow that caught fire after the girl said "Fire Pillow". Whereas according to residents around the girl was able to predict creating fire without making physical contact with the object. They believe the girl has the ability to control fire as a gift of God. An astonishing and real phenomenon that is allegedly caused by Pyrokinesis is the SHC (Spontaneous Human Combustion) phenomenon. People who experience this will burn spontaneously in a short time. It has been noted that some tragic cases of people who experience SHC stories can be read here. The Burning Human Phenomena Without Cause. These people are thought to intentionally or unintentionally generate pyrokinesis power but cannot control it. In addition to the examples above, there may be many more phenomena that support the existence of the power of pyrokinesis that is unknown to many people. 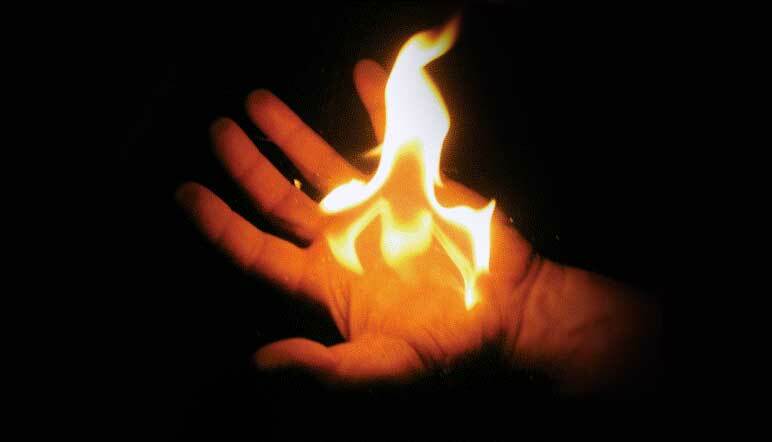 Pyrokinesis is actually a branch of Telekinesis. So for those who have the ability of telekinesis will be easier and faster to learn the science of fire control. Because in principle fire will emerge from heat and heat itself produced from the vibrations of atoms in an object. The faster the vibration, the temperature gets hotter and finally emits electromagnetic waves, namely light and fire. This is the simple principle if we are able to telekinesis we only need to focus on controlling the atom. Light the candle in a place that is not windy and calm. Now, look at the fire and concentrate on focusing on it and try to build a connection between your mind and your flame. Now close your eyes and visualize the flame as clearly as possible and also the movements for a moment. Try to feel the energy like in yourself. Now open your eyes and refocus on the flame. Now try to move the flame aside by visualizing it in your mind. Try to push the flame with your mental energy. The success of moving the flame cannot be achieved overnight. It takes tremendous effort and strength. It may take several days or months or years according to your will and concentration. Focusing on a flame does not mean concentrating in such a way as to torture yourself. The tension in your mind can cause other problems. The point is to focus on the target without any effort. After you get used to moving a fire with your mind, you can move on to the next step, which is to put it out. In the same way, concentrate and visualize in your mind's eye extinguishing the fire with your energy. This may take longer than moving the flame. So, it's better to give a pause after you succeed by moving the flame. If not, you may experience stress and tension. Now if you successfully extinguish the fire, then you can try turning it on again. If the mind is still focused, it is better to start focusing on the flame to immediately ignite after being extinguished. Because the wax axis is still hot and easily ignites again. Focus on the flame by using your energy and visualization, and concentrate on making it light up again. The final step in pyrokinesis training was very difficult and many failed at this stage, even though they managed to move and extinguish the flame. Turn on the candle and by focusing on the flame, visualize the tunnel between you and the flame. Now make the connection between you and the flame. Now when you feel the connection has been created, visualize the energy of the sphere of light and then move the ball of light into the fire. Now direct your mind to move the flame with the ball, in a certain direction, either up or down, right or left. With practice, you can even use this method to turn off the flame. With concentration, you can wrap the flame and not let oxygen enter. This will make the fire go out. So basically Pyrokinesis can succeed if we concentrate maximally and are good at visualizing it in detail and realism. But not only focus and concentration, but you must be sure, trust and patient. Good luck!